NOTE: many of the images on this page have been scaled. To see the larger image, click on the graphic and choose the "open this image" option. This page is GRAPHICS INTENSIVE. It might take a while to load. or several years after The Rocky Horror Picture Show became a cult phenomenon, watching movies at home on video tape was a new experience. Rabid fans kept Rocky in underground circulation as one of the first (and most popular) bootleg videos, but 20th Century Fox and Lou Adler were reluctant to release an official version - at least in the United States. There were several international video releases of The Rocky Horror Picture Show in countries outside the U.S. throughout the 1980s. The most prominent of these were a United Kingdom (PAL format) tape and a Japanese tape, both of which included the original theatrical version, in mono sound, with the "Super Heroes" scene included at the end of the film. In 1990, Fox decided to do an official release in the U.S., and similar marketing and package designs were used for releases in other countries thoughout 1990 and 1991. The first release of Rocky Horror in the United States was set for November 8, 1990. 20th Century Fox put a lot of effort into making the initial release of the video a very special occasion. Working with Lou Adler, they assembled a brief introductory segment which introduced the home audience to the special world of Rocky Horror fans. A music video for "The Time Warp" was also included after the film, showcasing the audience participation. Further, the film's soundtrack was remastered in stereo by Chace Productions to create a more dynamic experience for those with home theater equipment. Even the packaging was special. Parts of the tape shell were colored red for this initial release, and a special black and red label was made for the cassettes. The outer slipcase featured an embossed pair of lips and a red Rocky Horror Picture Show logo with reflective highlights. The tapes were released to video stores on both VHS and Beta formats with a retail price of $89.98, standard pricing for a video assumed to provide stronger rentals than sales. The US video release of the film did not include the song "Super Heroes," which had been removed from theatrical prints since 1976. However, Fox's later print runs with the stereo soundtrack from this video did include the song. CBS/Fox Video released a unique promotional tape to retailers to announce the arrival of The Rocky Horror Picture Show to video. The short (less than ten minutes) reel showed brief clips of the film, highlighting the songs and characters. Small snippets of audience participation were also present. 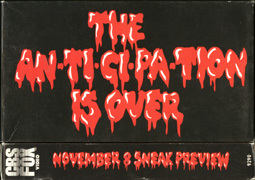 At the end of the preview, the sales and marketing material was presented to the accompaniment of a vocal-less "Over At The Frankenstein Place." The United Kingdom got a new video release of Rocky Horror in March of 1991. This version did not include any of the extras of the stateside version, but a reissue version was done later with the same content as the first US edition. Upon the first U.S. video release of Rocky Horror, Fox promised retailers a 2 year moratorium on the film. This meant that after the initial release, the video would not be available for at least 2 years. In November 1992, the holdout ended, and 20th Century Fox released a standard "sell-through" edition of Rocky Horror to the market. This version was priced at $19.95, but didn't include any of the spiffy extras which distinguished the original issue. The film was exactly the same version, with the new stereo soundtrack and "Super Heroes" missing. Fox put their first Rocky Horror Picture Show laserdisc on the market in 1992 as well. 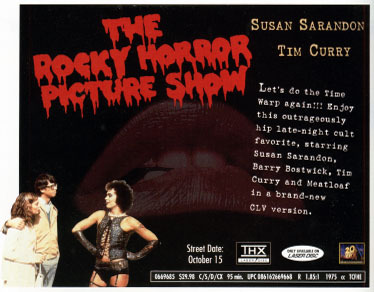 The front of the disc jacket was nearly identical to the tape version, with the ever-present lips and Rocky Horror Picture Show dripping blood logo. The disc contained the same version of the film as the video tape reissue, but they did include the "Time Warp" music video segment from the original tape issue. A laserdisc of Rocky Horror was also issued in the Japanese market in 1994. This release of the film was also the complete original theatrical cut, with "Super Heroes" included. The first pressings also included the original mono soundtrack. For Rocky Horror's 20th Anniversary in 1995, Fox planned an extensive special edition release of the film on laserdisc. A smaller scale reissue was also done on VHS tape. Initially announced for release on October 25, the package ran into some unfortunate delays and didn't surface in stores until December 20. The anniversary edition of Rocky Horror was, for the first time, presented in the original theatrical aspect ratio ("widescreen" or "letterboxed" in the video business). The audio of the film however, was still the remastered stereo version, and "Super Heroes" was not included as part of the film. The back of the laserdisc box said that the original mono soundtrack was available on one of the two additional audio tracks, however this was merely a combination of the left and right of the new stereo mix. On the second audio track, groups from Long Beach and Los Angeles, California were presented doing audience participation with the film. This track was difficult to listen to, however, because film sound was not added - only the audience could be heard. After the film, Fox included two additional credit endings which had been shown in theaters over the years. The second disc of the package included a number of supplemental items. First and foremost, the song "Super Heroes" was presented as a deleted scene. The long-thought-lost song "Once In A While" was also included, edited from the few film materials available. Most of side three is made up of "outtakes," which are bits of raw footage from four different scenes. Original production audio was not available for the outtakes, so the film soundtrack was cut up and synched with mouth movements to provide sound. The rest of the side is filled out with trailers, two sing-along numbers, and a still frame archive. Side Four is an hour long retrospective titled "The Rocky Horror Double Feature Video Show," mostly notable for extensive interviews with set designer Brian Thomson and director Jim Sharman. An Australian "21st Birthday Collector's Edition" release of the film was done on VHS in 1996. The Rocky Horror Picture Show logo in the photo may be difficult to make out. It appears the title was done in reflective ink. The advertising for this release touted "1 hour of bonus footage," which consisted of the Original Theatrical Trailer, a "Denton USA" Music Clip, the deleted scene "Once In A While", alternate takes, Sing Along-Sweet Transvestite, Original T.V.C. (Television Commercial), a 15th Anniversary Video Trailer and something titled "Rocky's Retrospective." The UK market also created a "21st Anniversary" special edition release in 1996, on laserdisc. Featuring liner notes from the British Rocky Horror fan club, Time Warp, the disc included a great deal of the material from the US special edition. However, this laserdisc issue is notable for including both stereo audio and "Super Heroes" as part of the film. 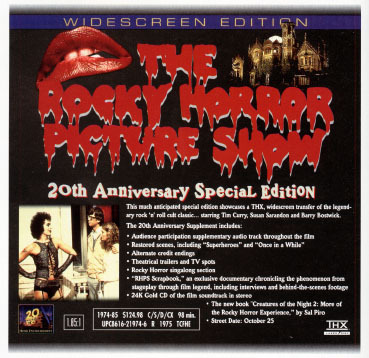 The UK market also reissued Rocky Horror on VHS on April 22nd 1996, with new package art. This version of the film also contained the stereo soundtrack and the "Super Heroes" scene. A new Japanese laserdisc was also issued in 1997. The author is unaware of the features on this edition, although it was a stereo issue. In October, 1997, 20th Century Fox finally released a letterboxed, single-disc edition of The Rocky Horror Picture Show. Before this reissue, the expensive laserdisc box set was the only place to get a letterboxed copy in the US. The disc cover was similar to that of the first laserdisc issue, however the top of the cover was adorned with a THX banner. With the growth of the laserdisc market and increasing consumer awareness, "widescreen" VHS editions began appearing in the late 1990s. The first widescreen VHS version of The Rocky Horror Picture Show was released on August 17, 1998 in the UK. Meanwhile, in the US, the contents of the 20th Anniversary laserdisc set were reconfigured for a single VHS edition. On Septmeber 15, 1998, three versions were released with new cover art. A standard, full-frame Special Edition, a Spanish subtitled version of the Special Edition, and a Widescreen Series Special Edition. If you can tell the differences in the samples above, let them know about it! DISCLAIMER: This site is not affiliated with 20th Century Fox, TCF Home Entertainment, MGM/UA, MGM Home Video, Chace Productions or any other entities refered to within this article. All copyrighted or trademarked artwork or names are used on this site within the context of review or informational purposes, defined by the United States Government as Fair Use.